I use 'PC' instead of Pacific City because I want to sound like a veteran surfer.. ha. 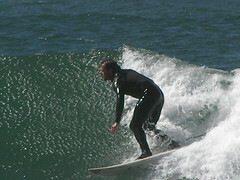 Actually, I'm no where near a veteran surfer as I got thoroughly thrashed while there with Chris Holm and Tiffany Gregg. We spent the morning there surfing some 10-12 foot waves (well for me it was trying to surf. Of course I went paddling right out to the big ones with Chris and tried to tackle the same ones he did.. unsuccessfully. He said it was a bad day to learn because there were a lot of quick "closeouts" of the waves. I did manage to catch one and get my feet planted on the board briefly going down the face of it before completely losing my balance and flying off. When I came to the surface with my hands above my head to protect me from the board leashed to my foot I got slammed by 2 more big waves in the set. After getting beat up a few more times I headed into the shore to get some videos and photos of Master Holm rippin' it. Tiffany soon joined me as she was getting cold. The three of us then got some lunch at a local sandwich shop and I got some oyster shooters and ice cream as well.... yeah, weird combo. It was a great day and I can't wait to get back out and do some more surfing! 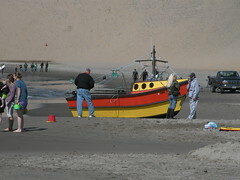 Check out the colorful dory boat that powered itself onto the beach. Click the title of this entry for a slideshow as always.